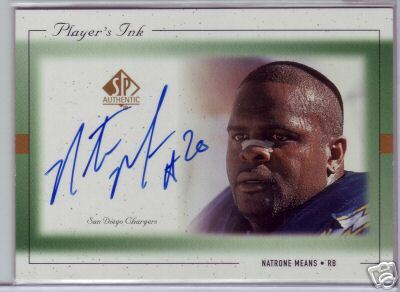 1999 SP Authentic Player's Ink certified autograph card of former San Diego Chargers superstar running back Natrone Means. Has congratulatory message on back confirming authenticity. With certificate of authenticity from AutographsForSale.com. ONLY ONE AVAILABLE FOR SALE.